CAMP KINSER, Okinawa, Japan — Decorating eggs for Easter is a tradition people throughout the world have been practicing since before the Middle Ages when they colored and gave them as gifts. Over the course of the holiday’s history, plain, dull chicken eggs have been painted and glittered as members of each generation add their own creativeness turning them into festive ornaments. Within the last 15-years, Easter eggs on Okinawa have taken on a new form of decoration as many people here are wrapping them in colorful Japanese Washi paper. 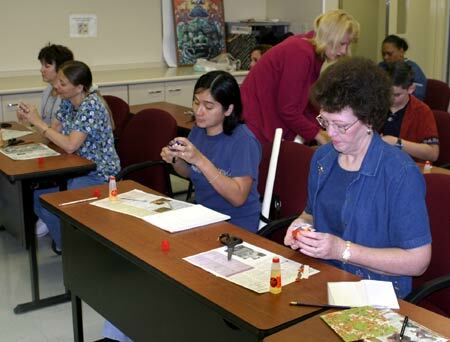 Patrons were given a chance to learn the craft at the Kinser Personal Service Center March 27. “Washi eggs” have become such a hit that classes are being given at Marine Corps Community Services PSCs on island to teach the art, according to Michiko Urasaki, community relations specialist for MCCS, PSC Camp Kinser. Before beginning construction, students took precise measurements of their eggs and then cut the amount of Washi paper needed to cover them without overlapping. 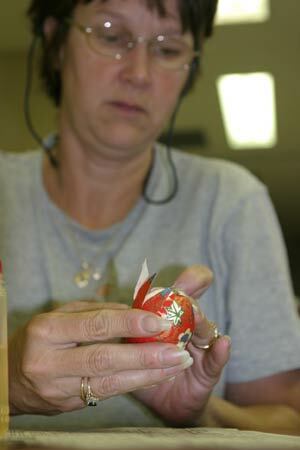 They then glued paper to egg combining Japanese folk art and a Christian holiday tradition. According to Urasaki, the idea of making “Washi eggs” a hobby originated from a close friend of hers.